I like shoes. A lot. Which isn't a problem until you consider that I can never throw a pair out, even if they're falling apart. This resulted in me owning 94 pairs of shoes, which is a sickening number, especially when I only wear about 10% of that number. 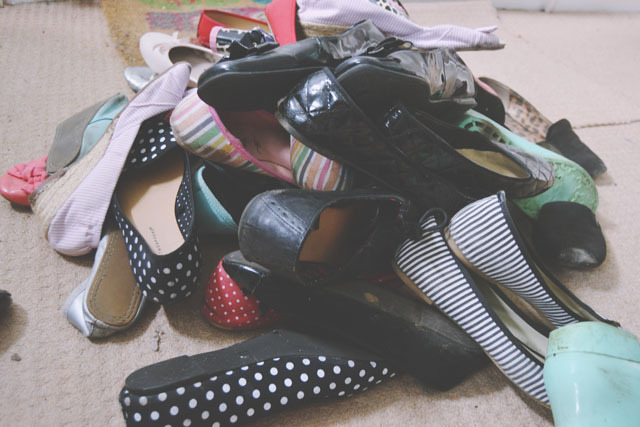 As you can see, my shoe storage was overflowing and it was becoming increasingly difficult to find the shoes I was looking for each morning. So I decided enough was enough, and set about throwing away all the old, dirty and broken pairs. In the end, I became quite ruthless, which is very unlike me, and threw out a grand total of 26 pairs. Look how beautiful that shelving is now! I'm so much happier with it, it makes finding shoes much easier and I have an excuse to buy 26 new pairs of shoes. Right? 26 pairs sounds perfectly reasonable to me! I love having a shoe wardrobe. I love the before and after. You must feel so freeeeeeee (ok slight exaggeration). I have a shoe problem too. It's like I can never have enough pairs. I probably have as many as you did pre-purge. I've been trying to sort through mine and donate the nicer ones I don't wear and throw out the crappy ones I don't wear anymore. I love that you use a bookshelf to store your shoes too! congrats on getting rid of a few old pairs, I have the same problem with teeshirts - even the stained holey ones I can't bear to part with. I need to take some inspiration from you and have a clean out! I cannot bear to throw out shoes either. I have about 30 pairs in my apartment which I always wear, but back home there is over 100. I really should go about sorting them out. I cannot throw anything fashion related away its too hard to bear to part from them, I feel your pain. On another note it is an excuse to get 26 new pairs hehe but thats just my inner shopaholic talking. It always feels very refreshing to have a good purge - well done!! Wow. I definitely own less than 10 pairs :3 I need more really!